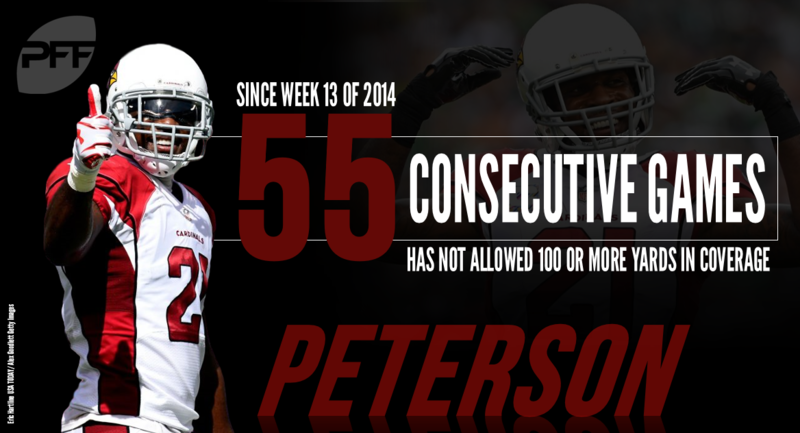 The PFF Top 101 is our best way of ranking the top players in the NFL for a given season. However, as with any cross-positional rankings, there’s an inherent subjectivity when trying to compare two players with two different roles. Below are the 10 players who had the best arguments to be included in the PFF Top 101. Among cornerbacks with at least 500 snaps in coverage this past season, no one gave up fewer catches (28) or yards (394) than Peterson. And he did it all by tracking opposing teams No. 1 receivers in 11 of their games this season — that’s usually a good thing for a corner. He did have a handful of downgrades where the quarterback missed his target and seven penalties on the season however, and that ultimately kept him off the list. It’s difficult for one play to keep a guy off the list, but there wasn’t a costlier misplay in all of the 2017 season than Williams’ whiff on Stefon Diggs to lose in the divisional round. Before that play, Williams had only five missed tackles all season long on 90 attempts. He still finished as a top-10 graded safety in a superb rookie season. Kendricks was sensational this past season filling in for Jordan Hicks down the stretch, earning himself a top-10 grade among linebackers. At the end of the day though, it wasn’t quite enough when he only managed 725 snaps including the postseason. Only Sean Lee and Reuben Foster made it at linebacker with fewer snaps than Kendricks. Thomas’ run as one of three players to make every PFF 101 finally comes to a close. There were some that still wanted him in considering how dominant he still was in seven games. His numbers extrapolated out to a full season would have made him the No. 1 tackle in the NFL, but no player has ever made the PFF 101 on so few games. 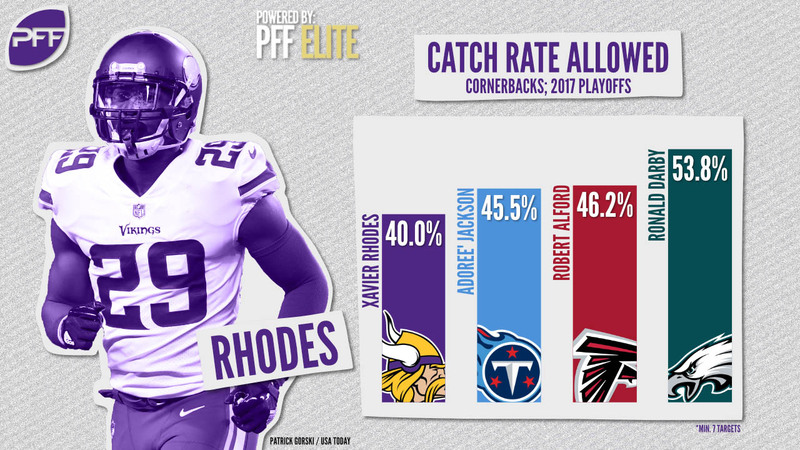 Rhodes has earned himself a reputation for tracking the opposing teams No. 1 receiver – which he did 10 times this season – but at the same time he all too often didn’t shut them down. He finished only 37th out of 86 qualifying cornerbacks in yards per coverage snap allowed and allowed a passer rating of 77.4. Solid numbers, but not quite 101. Yet another player whose lasting playoff image was difficult to shake. Tuitt would have likely been in the 90’s had his season ended in Week 17, but he was one of the many in the Steelers front seven members who got manhandled against the Jaguars in the playoffs. It was his lowest-graded game of the season and bumped him off the 101. Sitton has been a fixture on the Top 101 at guard over his career, but injuries limited him to only 712 snaps this season. He made the list in 2016 after playing only 734, but he also gave up half as many pressures last year (six) as he did this year (12). A full season from him though and he almost undoubtedly makes this list. While Peters didn’t give up as many big plays as he has in years past, he didn’t quite make as many on the ball either. He had 18 combined pass breakups and interceptions in 2016 and only nine this past season. Quarterbacks certainly have started to shy away from him though as his 79 targets were a career-low. 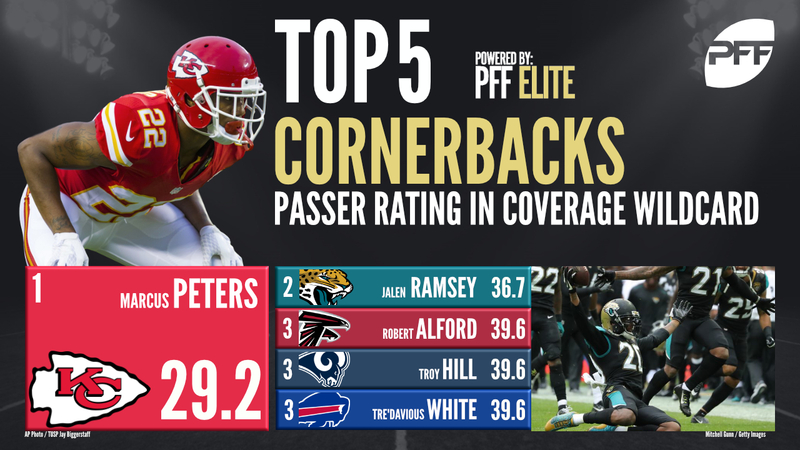 Peters, despite the loss in the wild-card round, also put forth a strong effort in his team’s lone playoff game as well, fielding just a 29.2 passer rating when targeted. It was Rivers highest-graded season since 2014, but his disappearing acts in two crucial games against the ultimate division-winning Chiefs were too much to overlook. He threw eight turnover-worthy throws in those two games alone, only countered it with one touchdown pass and averaged 232 yards per contest. Unsurprisingly, they lost both contests. Something tells me Ramczyk will be making a few of these before his career is over. This year however, he barely missed the cut. He was PFF’s eighth-highest graded tackle on the season and the six tackles to make the list all graded higher (Thomas also missed out). Ramczyk only gave up three sacks all season long and had 12 contests where he only allowed either no or just one pressure.